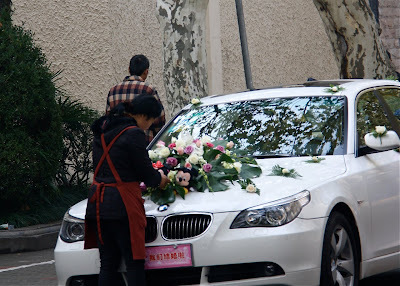 While we're on the topic of weddings, every Saturday and Sunday morning on Nanchang Lu, wedding cars line up to be decorated. 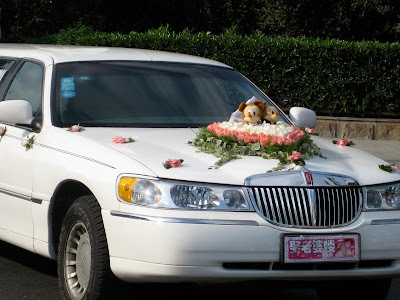 Now these are the cars that take you to your actual wedding. Not to your 'Themed Wedding Photo Day'. The decorations take hours, and may involve flowers, attractive Disney stuffed toys and pretty pink registration plate covers. 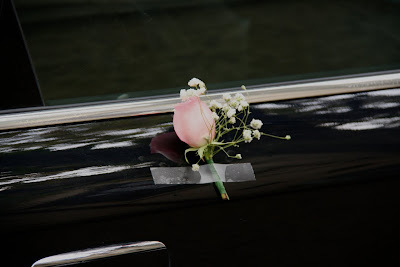 If you can't afford the stuffed toys, what the hell, just sticky-tape a few flowers to the doors and be done with it. And if a bit of duco comes off in the process.....never mind, you can probably repaint the whole car for less than the cost of the flowers.